The Venkat Trust is managed from the UK and the day to day work is carried out under the supervision of its trustees in Kovalam . 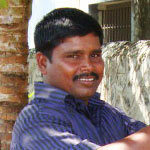 JR is the elder brother of Venkat, in whose memory the Trust was set up. Since then he has worked tirelessly for it, running the Kovalam operation and overseeing all the projects. 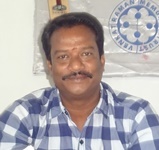 As a result of his outstanding work for the Trust, JR served for two terms as elected President of Kovalam, a highly respected position with wide responsibility and powers. Ali was Venkat’s close friend and is now both JR’s right hand man and also one of the Trust’s greatest champions. He has introduced many of our most loyal supporters to our work. He is involved in all aspects of the work, with particular responsibility for the sponsored children. Aarthi works with JR and Ali to keep the office in Kovalam running smoothly. 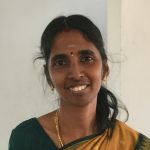 As well as responding to any queries from the UK trustees, she manages the sponsorships and organises the Sunday events for the sponsored children. She also liaises with students, schools and colleges to plan the young people’s transition from school to further education.